Everybody put your hands together. We have an awesome Fried Chicken recipe for you! Did someone say fried chicken?!!! I have a confession to make my friends. I am a fried chicken addict. 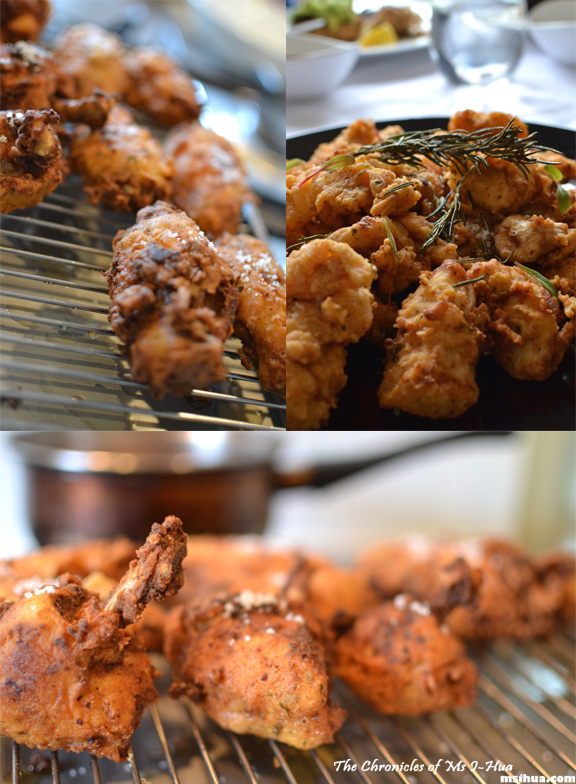 In particular I am an addict of the Boy’s version of Thomas Keller’s buttermilk fried chicken. The batter is golden, crunchy and crispy. The meat is juicy, tender and magnificent. As you take a bite into a piece of the chicken, you hear a resulting and satisfying “crunch”! If you would like to raise some fried chicken addicts and add a fail safe recipe into your repertoire, my advise would be to follow the basic formula below and chop and change as you will. I promise you will definitely have a finger lickin’ good time! Combine all brining ingredients and bring to a boil with lid covered. Stir and let it boil for a minute. Remove from heat and set aside to cool completely. Leave in refrigerator until required. Add all chicken pieces into brine and leave overnight in refrigerator. This is an important step if you want your chicken well seasoned and juicy when fried. Remove chicken pieces from brine and wash with cold water to remove excess herbs and spices. Pat dry with kitchen towels and leave to air-dry until it comes to room temperature. Add all Flour Coating ingredients into a large bowl and mix thoroughly. Transfer half of the flour mixture into a second large bowl. In a third bowl, pour in the buttermilk and season with some salt and ground black pepper. At this stage, you should have a bowl with the chicken pieces, 1st bowl of flour coating, bowl of buttermilk, 2nd bowl of flour coating and a wire rack to rest the chicken & drain the oil after frying. Pour oil into your deep fryer or a pot to deep fry your chicken. If you have a deep fryer, follow the manufacturer’s instructions on deep frying. If using a pot, do not fill more than 1/3 of your pot with oil. The oil temperature should be between 160-170 degrees Celsius. Start off with the chicken thighs, drumsticks or drumettes first. The wings and breast fillets will go in last. To start the process, dip chicken pieces into the 1st bowl of flour coating and coat all sides. Pat off any excess flour. Then, dip into the buttermilk bowl and allow any excess buttermilk to drip back into the bowl. Next, dip it into the 2nd bowl of flour coating and coat all sides. Gently lower the chicken pieces into the hot oil. Adjust heat to return oil to its proper temperature. Monitor the temperature and let it fry until it reaches a deep golden brown colour and feels crispy. Depending on different sizes and cuts, they may take from 5 to 12 minutes to cook. 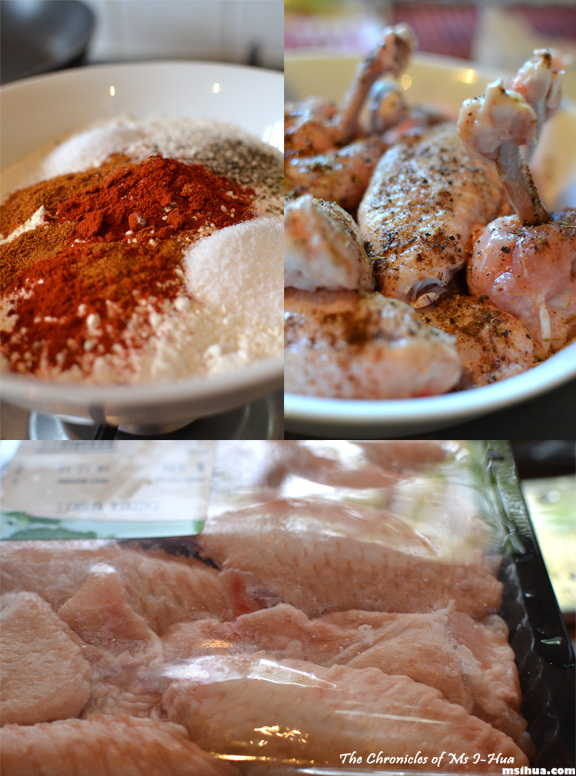 The chicken thighs and drumsticks usually takes longer to cook than the chicken breast and wings. Once cooked, transfer chicken pieces to the wire rack to drain any excess oil. 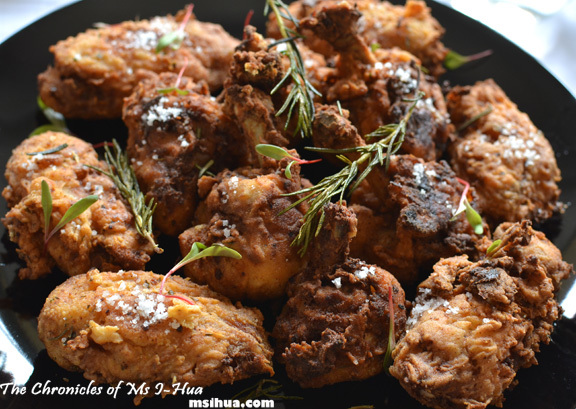 Sprinkle fried chicken with Fleur de Sel. Turn off the heat and place rosemary sprigs into the hot oil (it should still be fairly hot) for a few seconds to crisp up. Plate your Buttermilk Fried Chicken onto a platter and garnish with the fried rosemary sprigs and any micro-herbs available. Enjoy them while it’s still hot and crispy. Somehow, I found the version with the wings and drumettes to be a lot crispier and crunchier than the chicken breast, but the chicken breast were much more tender. 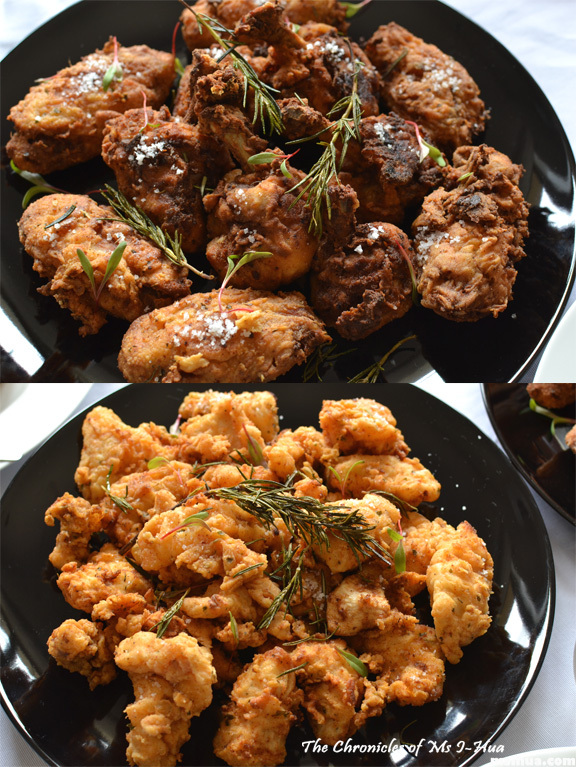 We served this at our Coffee Party and Blogger Christmas Party with a few friends and it was a smashing success… so much so that they have coined this the Gazza (the Boy) Fried Chicken, or GFC. I know Azzie has improved on the version above by coating the chicken with Panko breadcrumbs to make it even crispier! NOMS! So her version is the Azza Gazza Fried Chicken (AGFC for short). So tell me my dear readers, are you a fried chicken addict as well? Guilty pleasure. Know it’s bad for me, but I just can’t say no to fried chicken!!!! Michelle recently posted…Lunch @ Dish, Dua Annexe, Kuala Lumpur. What??? HOW IS THIS POSSIBLE? MAKE IT MAKE IT MAKE IT! SOOOO YUMMY! I’ll step right up for fried chicken anyday!! I love using buttermilk for fried chicken as it keeps the chicken so tender. I make a similar version to this but bake it to make it a little healthier – but hey sometimes you need the full on deep fried stuff! I don’t think I’ll be frying chicken at home as using huge amount of oil scares me. GFC looks super amazing though!! How can anyone NOT be a fried chicken addict? 😀 I love chicken, one of my favourite meats. In fact, I can say that for most meats because I like them all! 😛 Chicken though is very versatile and soooo juicy and delicious when fried. You would be surprise! But yeah.. I’ll eat them if anyone offers me too!